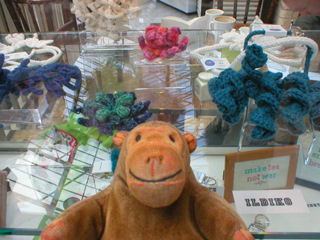 "A nice colourful monkey design would be a good thing, I think"
Mr Monkey looked at some felt and crocheted jewellery made by Ildiko Szabo and thought that if he had a lot of them it'd be a bit like a coral reef, only softer. 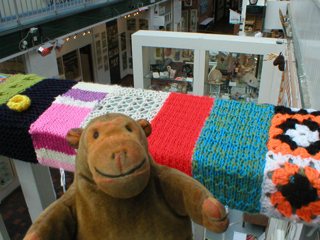 Then he finished his visit to the UK Craft Mafias by scampering upstairs to look at the yarnbombing - wrapping the banisters in knitting - started by Artyarn. As he left, he started thinking up ruses to persuade Miss Carol to knit a strip for the yarnbombing. You can read about Ildiko Szabo at the Ildiko website, about Artyarn at the Artyarn blog and about yarnbombing at the Yarnforward blog.